Table of descent and relationship; sometimes given in narrative form. 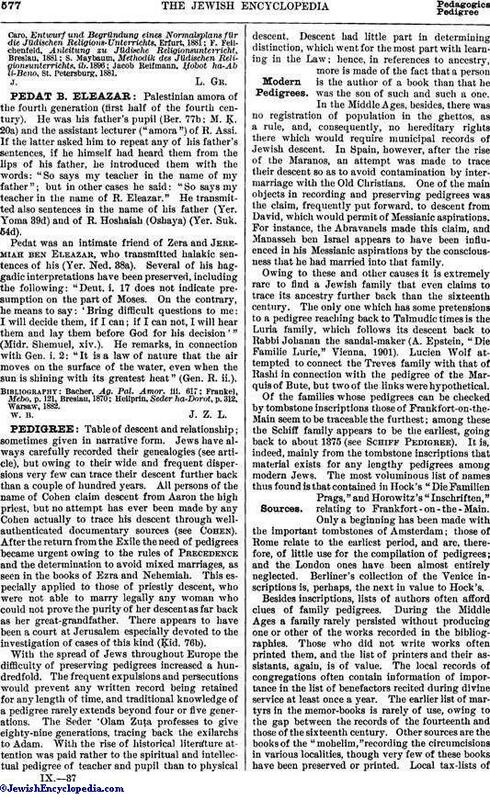 Jews have always carefully recorded their genealogies (see article), but owing to their wide and frequent dispersions very few can trace their descent further back than a couple of hundred years. All persons of the name of Cohen claim descent from Aaron the high priest, but no attempt has ever been made by any Cohen actually to trace his descent through wellauthenticated documentary sources (see Cohen). After the return from the Exile the need of pedigrees became urgent owing to the rules of Precedence and the determination to avoid mixed marriages, as seen in the books of Ezra and Nehemiah. This especially applied to those of priestly descent, who were not able to marry legally any woman who could not prove the purity of her descent as far back as her great-grandfather. There appears to have been a court at Jerusalem especially devoted to the investigation of cases of this kind (Ḳid. 76b). With the spread of Jews throughout Europe the difficulty of preserving pedigrees increased a hundredfold. The frequent expulsions and persecutions would prevent any written record being retained for any length of time, and traditional knowledge of a pedigree rarely extends beyond four or five generations. The Seder 'Olam Zuṭa professes to give eighty-nine generations, tracing back the exilarchs to Adam. With the rise of historical literature attention was paid rather to the spiritual and intellectual pedigree of teacher and pupil than to physical descent. Descent had little part in determining distinction, which went for the most part with learning in the Law; hence, in references to ancestry, more is made of the fact that a person is the author of a book than that he was the son of such and such a one. In the Middle Ages, besides, there was no registration of population in the ghettos, as a rule, and, consequently, no hereditary rights there which would require municipal records of Jewish descent. In Spain, however, after the rise of the Maranos, an attempt was made to trace their descent so as to avoid contamination by intermarriage with the Old Christians. One of the main objects in recording and preserving pedigrees was the claim, frequently put forward, to descent from David, which would permit of Messianic aspirations. For instance, the Abravanels made this claim, and Manasseh ben Israel appears to have been influenced in his Messianic aspirations by the consciousness that he had married into that family. Owing to these and other causes it is extremely rare to find a Jewish family that even claims to trace its ancestry further back than the sixteenth century. The only one which has some pretensions to a pedigree reaching back to Talmudic times is the Luria family, which follows its descent back to Rabbi Johanan the sandal-maker (A. Epstein, "Die Familie Lurie," Vienna, 1901). Lucien Wolf attempted to connect the Treves family with that of Rashi in connection with the pedigree of the Marquis of Bute, but two of the links were hypothetical. Of the families whose pedigrees can be checked by tombstone inscriptions those of Frankfort-on-the-Main seem to be traceable the furthest; among these the Schiff family appears to be the earliest, going back to about 1375 (see Schiff Pedigree). It is, indeed, mainly from the tombstone inscriptions that material exists for any lengthy pedigrees among modern Jews. The most voluminous list of names thus found is that contained in Hock's Die Familien Prags," and Horowitz's "Inschriften," relating to Frankfort-on-the-Main. Only a beginning has been made with the important tombstones of Amsterdam; those of Rome relate to the earliest period, and are, therefore, of little use for the compilation of pedigrees; and the London ones have been almost entirely neglected. Berliner's collection of the Venice inscriptions is, perhaps, the next in value to Hock's. Besides inscriptions, lists of authors often afford clues of family pedigrees. During the Middle Ages a family rarely persisted without producing one or other of the works recorded in the bibliograpḥies. Those who did not write works often printed them, and the list of printers and their assistants, again, is of value. The local records of congregations often contain information of importance in the list of benefactors recited during divine service at least once a year. The earlier list of martyrs in the memor-books is rarely of use, owing to the gap between the records of the fourteenth and those of the sixteenth century. Other sources are the books of the "mohelim," recording the circumcisions in various localities, though very few of these books have been preserved or printed. Local tax-lists ofthe period when Jews were separately taxed have been utilized, and a remarkable series of names was compiled by M. Freudenthal of the Jewish visitors to the Leipsic fair in the last quarter of the seventeenth century (Frankfort-on-the-Main, 1902). This list, with the tombstone inscriptions of Frankfort-on-the-Main, Lemberg, and Prague, gives a very fair account of the most important Ashkenazic Jewish families of the seventeenth century. A hitherto unexplored source for Sephardic families is the Inquisition records, mainly in Spain and Portugal, but found also in Mexico and South America. These contain a whole series of investigations into the family histories of persons accused of "Judaism," and it also frequently happens that, for one reason or another, Spanish families claim to have had their purity of blood ("limpieza de sangre")—that is, their freedom from Jewish blood—determined by the officers of the Inquisition. In both cases elaborate pedigrees were drawn up, which are of Jewish interest. One of these has been published by R. Gottheil in the "Jewish Quarterly Review" (1904), and further instances are referred to by Joseph Jacobs in his "Sources of Spanish-Jewish History" (Nos. 2, 14, 16). It is almost invariably a requirement for the establishment of the right to bear arms granted at the various heralds' colleges of Europe that a pedigree of the family making the claim shall be deposited in the herald's office. Many of these grants are of modern date, and the pedigrees supplied are often very scanty, but they are a hitherto unworked source of Jewish genealogies, and the list given under Coat of Arms must also be regarded as offering to those having access to the heralds' colleges material for the pedigrees of Jewish families. Baer, B.—Stammtafeln der Familie Speyer. Frankfort-on-the-Main, 1896. Carmoly.—Sefer Dibre ha-Yamim. Frankfort-on-the-Main, 1850 (Ibn Yaḥya). Epstein, D.—Die Familie Lurie. Vienna, 1901. Freudenthal, S.—Aus der Heimat Mendelssohn's (containing Wolff pedigree), Berlin, 1900. Friedberg, B.—Gesch. der Familie Schorr. Frankfort-on-the-Main, 1901. Harkavy, A.—Stammbuch der Familie Harkavy. New York, 1903. Kahana, Samuel.—Familienstammbaum der Bekannten Jüdischen Familien Horowitz, Heilpern, Rappoport, Margulies, Schorr, Katzenellenbogen, etc. Cracow, 1903. Kaufmann and Brann.—Die Familie Zunz. Breslau, 1895. Neustadt, L.—Stammtafeln der von Liebmann-Schwarzschild (1555-94) Abstammenden Familien. Frankfort-on-the-Main, 1886. Ullmann, E.—History of the Worms Family. Frankfort-on-the-Main, 1887. Wolf, L.—The Families of Yates and Samuel of Liverpool. London, 1901. Apart from these, a certain number of pedigrees have been privately printed. 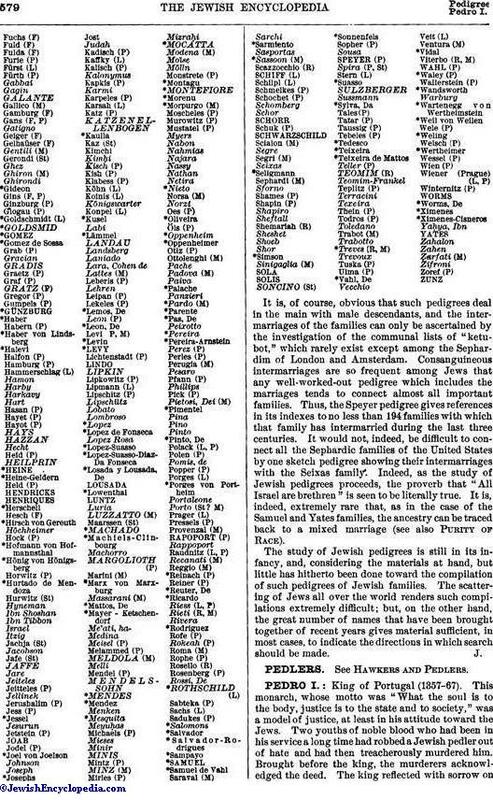 The largest collection of Jewish pedigrees ever made is that contained in the volumes of The Jewish Encyclopedia; they are indicated in the following list, which is intended as a guide to those investigating Jewish pedigrees. Besides the pedigrees therein contained (see names below in capitals) it gives also a number of articles on important families (names italicized), and these frequently contain sufficient material for pedigrees. The names of families bearing coats of arms are also given (marked with asterisks). In addition to these, there are the names of families contained in the great tombstone inscriptions of Frankfort-on-the-Main (marked F), Prague (P), and Rome (R); and for Italy the list contained in Mortara's "Indice" (M) often gives valuable information. The list of visitors to the Leipsic fair (L) at the end of the seventeenth century, made by Freudenthal, includes family lists that are practically equivalent to pedigrees. The pedigrees contained in Steinschneider's "Bodleian Catalogue" are given (St). It sometimes happens that information about certain Jewish families is contained in all or in a number of these sources. It is, of course, obvious that such pedigrees deal in the main with male descendants, and the intermarriages of the families can only be ascertained by the investigation of the communal lists of "ketubot," which rarely exist except among the Sephardim of London and Amsterdam. Consanguineous intermarriages are so frequent among Jews that any well-worked-out pedigree which includes the marriages tends to connect almost all important families. Thus, the Speyer pedigree gives references in its indexes to no less than 194 families with which that family has intermarried during the last three centuries. It would not, indeed, be difficult to connect all the Sephardic families of the United States by one sketch pedigree showing their intermarriages with the Seixas family. Indeed, as the study of Jewish pedigrees proceeds, the proverb that "All Israel are brethren" is seen to be literally true. It is, indeed, extremely rare that, as in the case of the Samuel and Yates families, the ancestry can be traced back to a mixed marriage (see also Purity of Race). The study of Jewish pedigrees is still in its infancy, and, considering the materials at hand, but little has hitherto been done toward the compilation of such pedigrees of Jewish families. 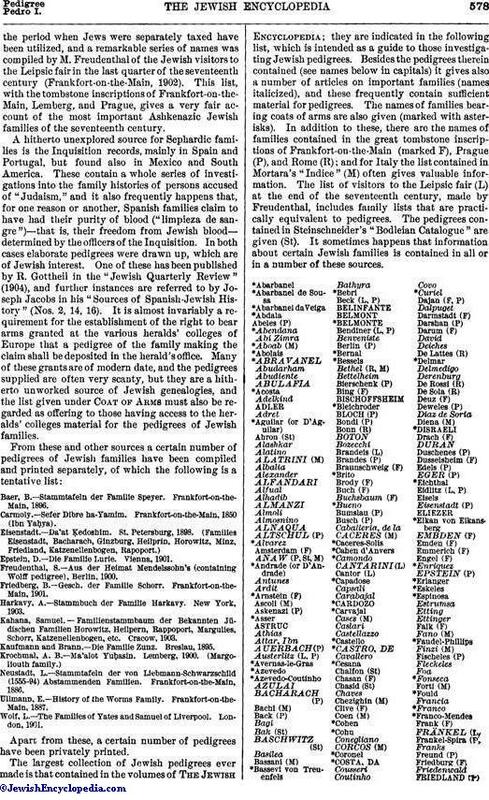 The scattering of Jews all over the world renders such compilations extremely difficult; but, on the other hand, the great number of names that have been brought together of recent years gives material sufficient, in most cases, to indicate the directions in which search should be made.